The first mission to successfully* send a rover to Mars, NASA’s Mars Pathfinder, launched on Dec. 4, 1996. It was a “budget” Discovery mission designed to demonstrate a low-cost method for delivering a set of science instruments to Mars and sent the first remote-controlled vehicle to be used on another planet. Solar-powered and only a foot in height, the little six-wheeled Sojourner was the foundation for all future Mars rovers…and, along with the Carl Sagan Memorial Station, gave us our best views of the Martian surface since the Viking 1 and 2 landers. 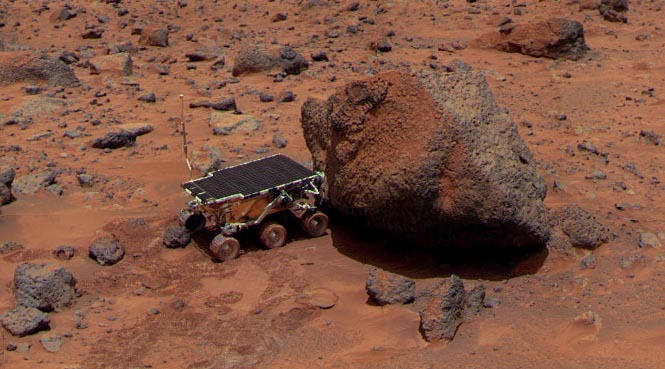 The Mars Pathfinder mission delivered a 23-lb rover (only 8.6 lbs on Mars!) named Sojourner after civil rights crusader Sojourner Truth on the surface of Mars on July 4, 1997. It used an inflatable airbag landing system and an innovative opening-petal design of the lander, dubbed the Carl Sagan Memorial Station. These designs have been used since in various incarnations to land other rovers on Mars. 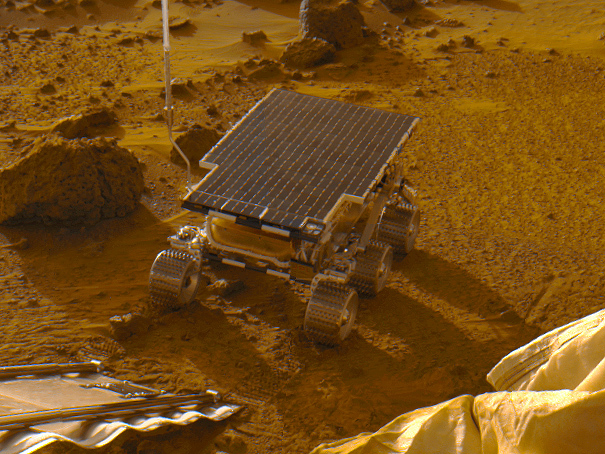 Sojourner spent the next 83 days exploring the Martian terrain around the Station, capturing thousands of images and taking literally millions of chemical, atmospheric, and other scientific measurements. 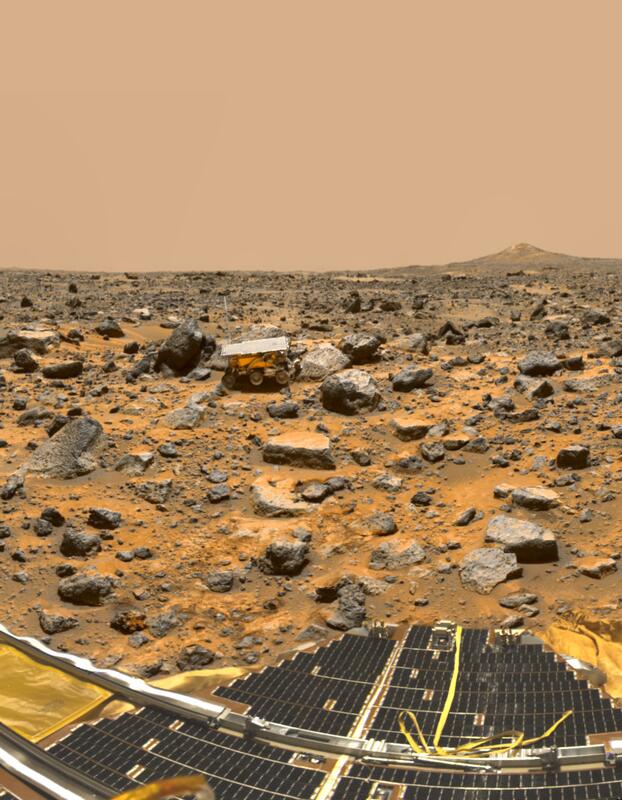 Thanks to the data collected by Sojourner, researchers were able to determine that the Ares Vallis region where Mars Pathfinder landed was once warm and wet. FACT: Mars Pathfinder spotted dust devils on Mars in 1997! The last successful data transmission cycle from Pathfinder was completed at 3:23 a.m. PDT on September 27, 1997, which was sol 83 of the mission. A final signal without any spacecraft data was received a little over a week later on October 7. The Pathfinder mission was a phenomenal success and officially declared concluded on March 10, 1998. FACT: Sojourner’s control system was built around an Intel 80C85 computer processor with a speed of 100,000 instructions per second and 500kb of RAM! Both lander and rover well outlived their design lives—the lander by nearly three times, and Sojourner by 12. The trove of information gathered by the Sojourner rover paved the way for future generations of robotic Mars explorers, from Spirit and Opportunity to Phoenix and eventually the Mars Science Laboratory rover, Curiosity. 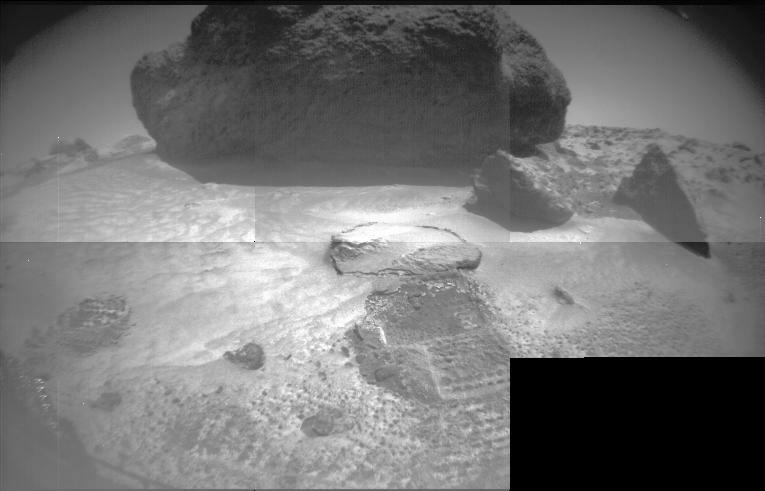 Learn more about the Pathfinder mission here and see images from the lander here and the rover here. *NOTE: NASA’s Sojourner was the first Mars rover that worked. The first rovers ever on Mars were the sled-like Prop-Ms, sent aboard the Soviet Mars 2 and 3 spacecraft in 1971. Mars 2 crashed, and Mars 3 ceased communication 15 minutes after landing. Neither ever deployed a rover. Read more here. Please like, share and follow us. Thank you.